For those that follow the PGA Tour what a breath of fresh air to see Ernie Els vault up the leaderboard this past Sunday at the Barclays. His game in a funk for awhile is lately looking a lot better. Beautiful to see him firing on all cylinders definitely a pick his week at the Deutsche Bank Championship. Ernie Els and J.J. Henry were in Canada on Monday, more Air Miles for Ernie. 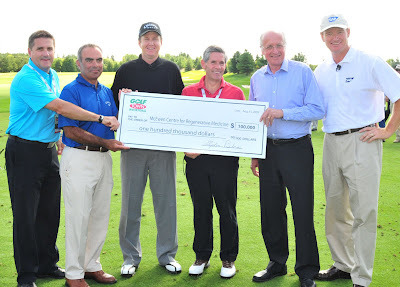 They were the stars of Golf Town’s annual charitable day at Magna Golf Club in Aurora, Ont. Hopefully we'll see more of Els in Canada real soon. Wouldn't it be great to see him play the Canadian Open. We can only hope. Hopefully he's also rested for the Deutsche Bank Championship. Check out Rick Young's blog post about what Henry and Els think about the new rules governing grooves coming up Jan. 1, 2010.